We will now prove this theorem. 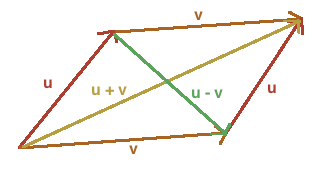 Theorem 1 (The Parallelogram Identity): Let $V$ be an inner product space. If $u, v \in V$ then $\| u + v \|^2 + \| u - v \|^2 = 2\| u \|^2 + 2 \| v \|^2$.